As novel endovascular strategies are developed for treating neurological disease, there is an increasing need to evaluate these techniques in relevant preclinical models. The use of non-human primates is especially critical given their structural and physiological homology with humans. In order to conduct primate endovascular studies, a comprehensive understanding of the carotid anatomy is necessary. We therefore performed a detailed examination of the vessel lengths, lumen diameters and angles of origin of the baboon extracranial carotid system. We characterized the extracranial carotid system often male baboons (Papio anubis, range 15.1–28.4 kg) by early post-mortem dissection. Photographic documentation of vessel lengths, lumen diameters, and angles of origin were measured for each segment of the carotid bilaterally. The common carotid arteries averaged 94.7 ± 1.7 mm (left) and 87.1 ± 1.6 mm (right) in length. The average minimal common carotid lumen diameters were 3.0 ± 0.3 mm (left) and 2.9 ± 0.2 mm (right). Each animal had a common brachiocephalic artery arising from the aorta which bifurcated into the left common carotid artery and right braciocephalic artery after 21.5 ± 1.6 mm. The vascular anatomy was found to be consistent among animals despite a wide range of animal weights. The consistency in the Papio anubis extracranial carotid system may promote the use of this species in the preclinical investigation of neuro-interventional therapies. There has been a recent interest in developing aggressive interventional strategies for the treatment of a variety of neurological diseases including stroke, subarachnoid hemorrhage, and head trauma [1–4]. Successful translation of these therapies to the clinical arena, however, is critically dependent on the use of appropriate experimental models . Non-human primate models of neurological diseases currently exist and have the advantage of most closely mimicking human physiology . These models are particularly relevant to neuro-interventional research in that anatomical similarities permit routine vascular access and evaluation of devices designed on a clinically relevant scale. Conducting experimental primate endovascular studies, however, requires a comprehensive understanding of the carotid vascular system. Previous investigations of non-human primate vascular anatomy have focused primarily on the general morphology of the vessels and not on vessel angles, lengths, or lumen diameters which are necessary for guiding endovascular technology [7, 8]. To answer these questions, we performed a study of extensive dissections of the male Papio anubis to determine the dimensions of the carotid artery system and the extent of its variability. All animal care and experimental procedures were approved by the NIH Guide for the Care and Use of Laboratory Animals. Ten male baboons, weighing 19.6 ± 1.4 (range: 15.1–28.4) kg, underwent post-mortem examination to determine vessel lengths, lumen diameters, and angles of origin of the extracranial carotid system. At dissection, a sternotomy was performed, the pericardial sac opened, and the arch of the aorta was extensively exposed. The branch vessels arising from the aorta which supply the head, neck, and both upper extremities were further dissected and identified according to homologous structures in humans (Figure 1a). The angles of origin (degrees) were measured for each vessel relative to the parent artery. The length (mm) of each vessel was measured from its origin to its bifurcation into daughter vessels. The extracranial length of bilateral internal carotid arteries was measured from the carotid bifurcation rostrally to the skull base. The greatest lumen diameter of the vessels (mm) was determined by measuring the external vessel width at maximum saline perfusion minus the thickness of the vessel walls in cross section. Dual measurements were performed for relevant arteries with the neck both in flexion and extension. Papio anubis extracranial carotid system. 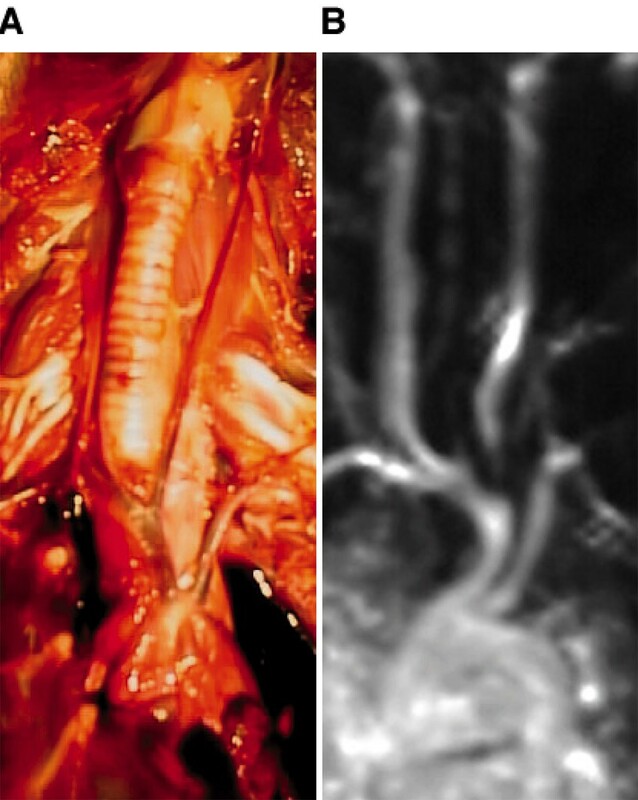 The baboon extracranial carotid system was a) dissected at autopsy and b) represented by contrast magnetic resonance angiography. Two animals underwent contrast magnetic resonance angiography (MRA) just prior to autopsy. Gadolinium (25 cc) was perfused through a peripheral venous line and coronal images of the vessels of interest were generated. The arterial branch anatomy was confirmed radiographically and parallel MRA measurements were performed for comparison with autopsy values. Mean measurements with SEM and range are represented (Table 1). A schematic with mean values is provided (Figure 2). Schematic of Papio anubis anatomy with mean values. Mean vessel lengths (mm), lumen diameters (mm), and angles of origin (degrees) are represented for the baboon extracranial carotid system. Dimensions of Papio anubis extracranial carotid artery anatomy. 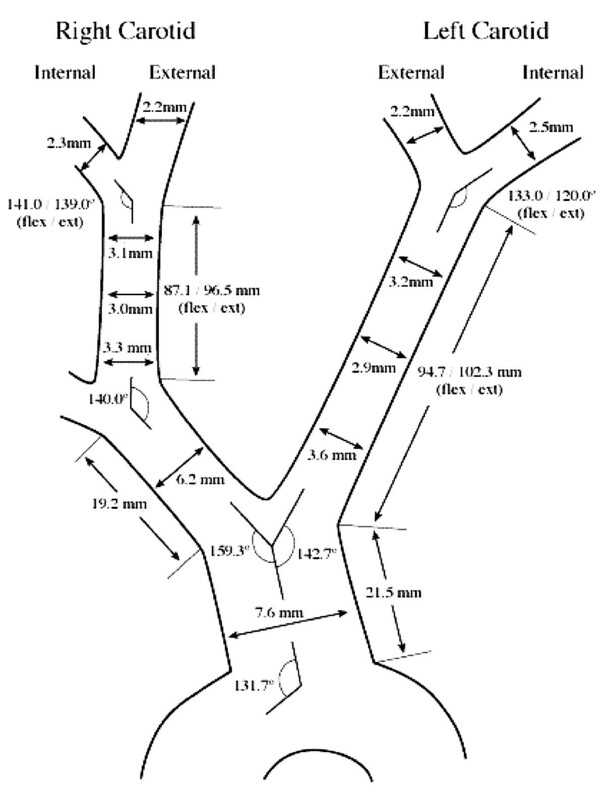 Dimensions of Papio anubis extracranial carotid artery anatomy. Vessel lengths (mm), lumen diameters (mm), and angles of origin (degrees) were measured at autopsy. Mean values with SEM and range are represented. Dual measurements with the neck in flexion and extension were performed for relevant vessels. Ten subjects were studied for each measurement except where indicated (*n = 6). Contrast MRA scans were obtained for two animals. Radiography revealed the same branch anatomy as observed at autopsy (Figure 1B). The mean differences between MRA and autopsy measurements were 4.6 ± 1.1 mm (length) and 0.9 ± 0.1 mm (lumen diameter). The mean difference in angle of origin radiographically and at autopsy was 22.6 ± 6.0°. Developing technology for innovative neuro-interventional therapies requires appropriate experimental models for safety, feasibility, and efficacy studies. The use of non-human primates in such preclinical investigations offers significant benefits. Primates share closer structural and physiological homology when compared to other animal species. Also, conventional endovascular techniques in adult baboons may be performed safely and easily when compared to smaller animals with limited vascular access. Conducting primate endovascular studies, however, is dependent on a comprehensive understanding of the anatomy of the baboon extracranial carotid system and the extent of its variability. Our study provides a detailed examination of vessel lengths, lumen diameters, and angles of origin in ten male baboons. Our findings reveal several important conclusions. First, the species investigated showed little variability in aortic and carotid branch anatomy. All ten animals demonstrated a common brachiocephalic artery giving rise to a left common carotid and right brachiocephalic artery. Second, vessel lengths and lumen diameters were consistent across all animals. The angle of origin varied considerably for all vessels. This variability may be attributed to several factors. Minor differences in the lengths of parent and daughter vessels may significantly alter the magnitude of the angle of origin. Structural differences in the surrounding soft tissue may also affect the course of branching vessels. Lastly, the degree of neck flexion and extension likely is reflected in the measurements. Notably, the measurements of vessel lengths and lumen diameters recorded at autopsy were comparable to those performed on MRA. MRA, albeit a compiled two-dimensional image, provides a valuable radiographic correlate to the pathology findings. The lumen diameters depicted on MRA specifically represent the vessels at normal physiologic arterial pressure. Interestingly, in the small carotid vessels, the lumen diameters on MRA were measured to be larger than the diameters observed at autopsy. This phenomenon is likely secondary to increased perfusion of smaller vessels in vivo. In any event, these data present a practical lumen diameter to guide endovascular catheter design. In conclusion, we found consistent dimensions and little variability in the Papio anubis extracranial carotid system. The uniformity in vessel anatomy and the close homology of baboons to humans suggest that the use of this species for translational models may greatly serve future development of novel endovascular technology. Dr. J Mocco is supported by a Postdoctoral Fellowship from the American Heart Association, Heritage Affiliate. Dr. E. Sander Connolly is supported by the National Institutes of Health (R01 NS 40409). The authors would like to thank Daniel Batista for his excellent technical assistance.